A Trash to Treasure craft project! Recycle your old jeans into miniature denim pocket purses. A best selling bazaar craft. Cut out the pocket from the jeans, front and back so when its cut out it has an opening at the top. Glue lace all around top of pocket make sure you don’t glue opening shut. Glue ribbon all around front and back side. Put the silk flowers on top of corners. Glue the stringed beads onto the inside of pocket. Done! This project lends itself to individual creativity, as the photos at right clearly illustrate. They were contributed by Cindy, a member of the WasteNothing Yahoo group, who kindly consented to share these photos. 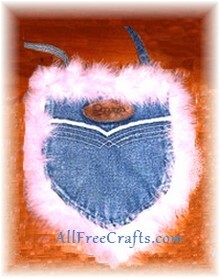 These lovely denim pocket purses are just two of the many variations possible with different trimmings, embroidery or embellishments.